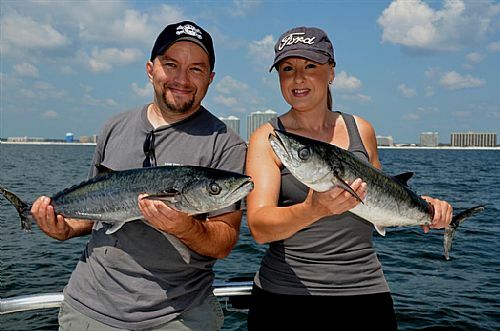 Fall is upon us and the trolling fishing is red hot near the beaches of Gulf Shores and Orange Beach. The crowds are gone for now and there is some excellent fishing available going on. The Spanish are huge (4 to 5 pounds) and we call them Axe Handles because of their enormous size. The weather has cooled off and we are in the high sixties at night and low eighties during the day. The combination makes for a more pleasant day deep sea fishing. If you are coming down for the shrimp festival around Oct 11 to the 14th, you need to make your reservations now. Our bookings are filling up and we can still get in an afternoon trip, which is just as good as the morning trips. Come give us a call and we promise to take care of your family.